No, not me! My little boy. See, he likes to play in the tub – for a long time. A very long time. And I have things to do. Lots of things. He likes to splash a lot, too. And he likes to splash so much that it soaks the floor. I simply drape the decorative curtain over the curtain rod so the clear plastic shower curtain shows. It not only keeps the water in the tub and off the floor, but I can see him at all times. I do my makeup, clean the bathroom and whatever else I can think of that keeps me close by and within sight of him. This is the perfect solution for me and for Ian. Because you don’t want to see him upset. Not a pretty sight. If I can avoid that within reason, I usually give it a try. If you don’t have a clear, plastic shower curtain, I highly recommend you go get one. Buy the super cheap ones because you’ll want to replace them every now and then when they get all gross and crusty. WARNING: Do not leave infants unattended – EVER! 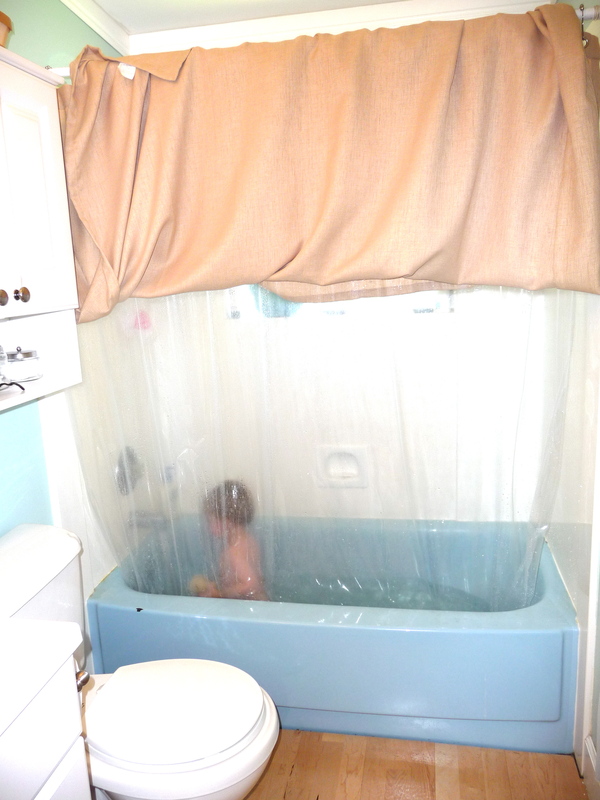 This entry was posted in Organizing and tagged bathtub, shower curtain. Bookmark the permalink.